Holger Bech Nielsen, of the Niels Bohr Institute in Copenhagen, and Masao Ninomiya of the Yukawa Institute for Theoretical Physics in Kyoto, Japan, have ended up with the theory that the Future is trying to stop us from creating a Higgs boson particle… While it is a paradox to go back in time and kill your grandfather, physicists agree there is no paradox if you go back in time and save him from being hit by a bus. 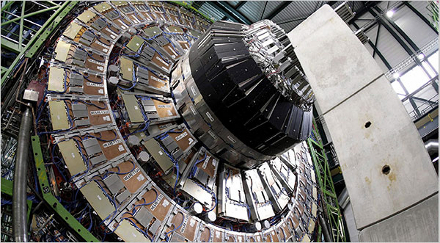 In the case of the Higgs and the collider, it is as if something is going back in time to keep the universe from being hit by a bus. Although just why the Higgs would be a catastrophe is not clear. If we knew, presumably, we wouldn’t be trying to make one. You are currently browsing the eneve.wordpress blog archives for October, 2009.